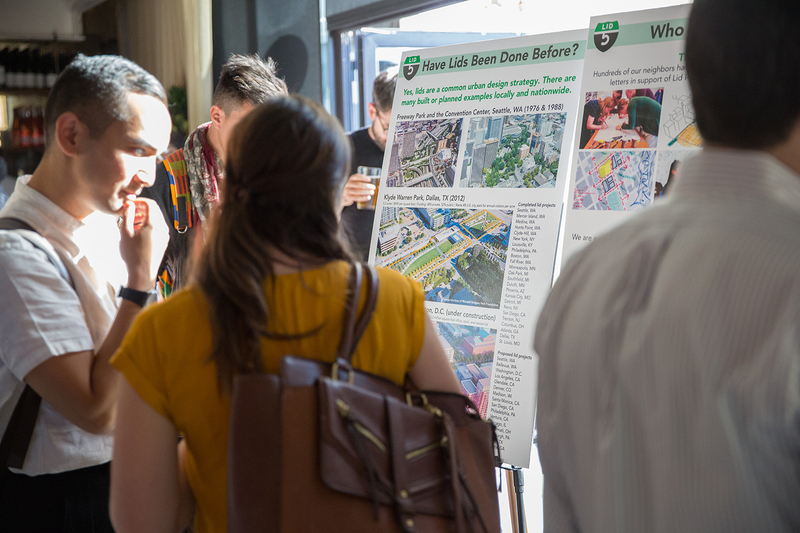 The Lid I-5 Steering Committee is a volunteer group of Seattle residents advancing the concept of lidding Interstate 5 citywide to reconnect neighborhoods and create new land for public and private uses. The group is fiscally sponsored by the nonprofit Seattle Parks Foundation. The Lid I-5 Steering Committee’s primary objective is initiating a Seattle Lid Feasibility Study. Partial funding has been offered by the Washington State Convention Center as a public benefit associated with its major expansion project. The City of Seattle’s Office of Planning and Community Development has confirmed it will manage the study if funding is secured. Existing freeway lids in the region include Freeway Park and the Washington State Convention Center above Interstate 5 and several lids over Interstate 90 and State Route 520. Dozens of other built and planned lid projects across the nation are helping growing cities reconnect street grids, reduce pollution, and restitch urban neighborhoods to improve quality of life, economic well-being, and public health. Lid I-5 is a community organization working to continue the effort of lidding Seattle’s freeways for parks, housing, community facilities, and other public uses. They are sponsored by the Seattle Parks Foundation, a philanthropy-based organization that encourages public-sector investment and private-sector giving to help create, activate, and care for public spaces throughout Seattle. For information visit www.lidi5.org. Attendees at the Lid I-5 Community Open House in June 2017. Photo credit: Alex Garland Photography.